the pursuit of metappiness: have you heard the latest? The return of the #metabeertalks was a success! And building on that positive note, we finished off the week with the team shipping the new and shiny Atlas admin interface from where you can create and manage your Atlas API key. It’s pretty fair to say we had a great week! 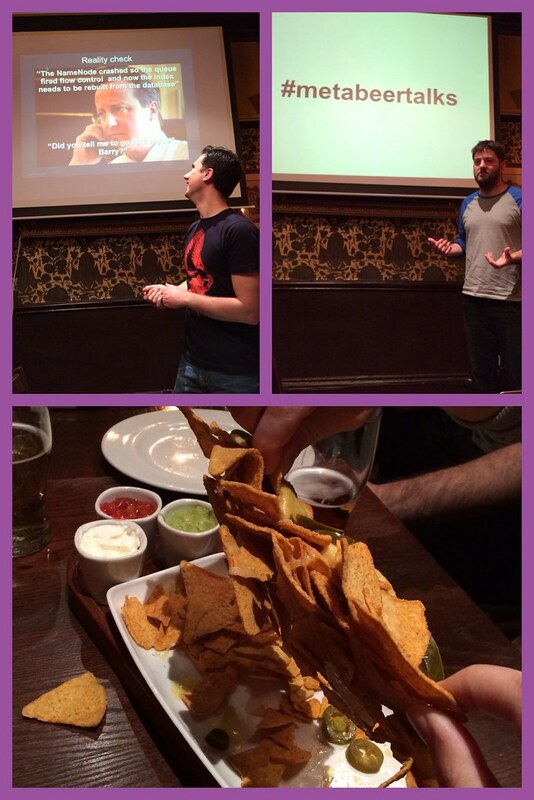 Last Wednesday we had the pleasure of a couple of great talks. The first one, by Sergio Bossa, was about Datastax Search on top of your data, why it’s useful, how to use it (including a 2 minutes demo!). The second talk had our own James telling us about machine learning and neural networks—how to train a machine to do complex work for you. If you’ve ever attended any of our #metabeertalks you won’t be surprised that we indulged in quite a bit of nibbles and drinks throughout the evening either! Yep… All the tortilla chips made a little fusion dance and became one gigantic nacho! The team is mostly made up of Engineers, so coding is second nature around here. Expect if we’re talking Morse Code. Nope, not *about* morse code! In all fairness it almost looked like second nature; for a while we got pretty involved! See how it all started? The conversation progressed, and soon there were several of us involved, but I guess this snippet shows what we’re getting at! How did your week go? Feel free to share below or tweet us! the pursuit of metappiness: up, up, up… and away!